The Collinsville City Commission met Monday April 7th (at the City Hall Community Room, 106 N 12th Street) for a 7pm regular of the Municipal Authority & City Commission. A. Approval of minutes of March 18, 2008 regular meeting. C. Supplemental Appropriation in the amount of $32,400.00, payment to Planetary Electric regarding ice storm damages. D. Supplemental Appropriation in the amount of $9,330.00 payment to Cooper Power regarding ice storm damages. E. Supplemental Appropriation in the amount of $8,726.00 payment to Stuart C. Irby Co. regarding ice storm damages. F. Supplemental Appropriation in the amount of $57,165.00, payment for Cab & Chassie for Digger Derrick. Bob Wolfram working on other potential grants (Hazard Mitigation) for tornado warning, saferooms, drainage clean-out master plans, & underground electric study. Bob mentioned many street drains clogged and Mayor Sallee mentioned many creeks still clogged. 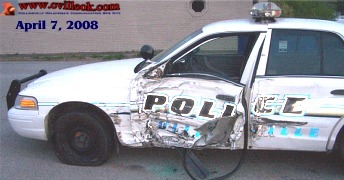 Officer Michael Dunning barely escaped injury when his Collinsville Police cruiser was struck with him standing in front of it assisting Owasso police on Highway 169 (at 96th) Sunday (April 6) about 9:40pm. The driver that struck the cruiser was aparently intoxicated. That police unit is now out of commission. E-911 equipment to be installed Tuesday April 8th at PD. 161 tickets were on last court docket (covering 3 weeks). Mike Rohr has resigned from street dept. Mayor Sallee comment on the potentiall use of county imates for 2 day a week brush cleanup work. POSTED 4/4/2008 at 4:00 p.m. by Angela Long, City Clerk. C. Cemetery Deeds: Ronald or Hilda Fleetwood, 3 spaces; Carol Norrid, 8 spaces. D. Supplemental Appropriation in the amount of $800.00, Forestry Grant. E. Supplemental Appropriation in the amount of $58,591.00 for T300 Bobcat. 5. Discussion and possible acceptance of a Petition-Consent Letter from the Cherokee Nation to annex territory containing 3 acres in Section 20, Township 22 North, Range 14 East within the City of Collinsville. (see note at right). This was approved after a discussion with unknown plans for future burials in the historic inactive Victory Cemetery. 7. Consideration and possible action to approve Collinsville Firefighters Local 3310 Fiscal Year 2007-2008 contract. -- approved, there were no raises last year. Some slight increased in this with the combing of the fire/EMS departments. This approval was the 2007-2008 contract. Negotiations continue for 2008-2009. Public Hearings: "Prohibiting all new outdoor advertising sign" & "apprerance code for new commercial buildings"